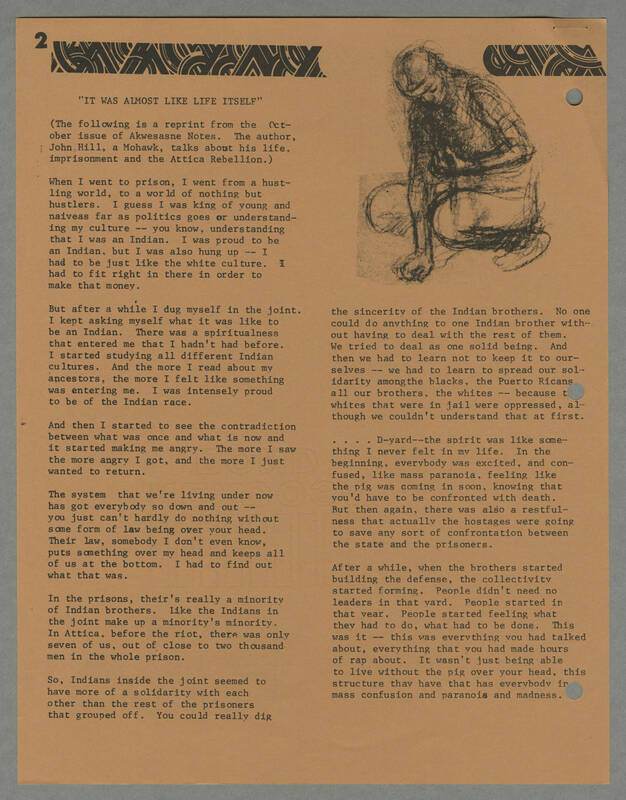 2 "IT WAS ALMOST LIKE LIFE ITSELF" (The following is a reprint from the October issue of Akwesasne Notes. The author, John Hill, a Mohawk, talks about his life imprisonment and the Attica Rebellion.) When I went to prison, I went from a hustling world, to a world of nothing but hustlers. I guess I was king of young and naiveas far as politics goes or understanding my culture -- you know, understanding that I was an Indian. I was proud to be an Indian, but I was also hung up -- I had to be just like the white culture. I had to fit right in there in order to make that money. But after a while I dug myself in the joint. I kept asking myself what it was like to be an Indian. There was a spiritualness that entered me that I hadn't had before. I started studying all different Indian cultures. And the more I read about my ancestors, the more I felt like something was entering me. I was intensely proud to be of the Indian race. And then I started to see the contradiction between what was once and what is now and it started making me angry. The more I saw the more angry I got, and the more I just wanted to return. The system that we're living under now has got everybody so down and out -- you just can't hardly do nothing without some form of law being over your head. Their law, somebody I don't even know, puts something over my head and keeps all of us at the bottom. I had to find out what that was. In the prisons, their's really a minority of Indian brothers. Like the Indians in the joint make up a minority's minority. In Attica, before the riot, there was only seven of us, out of close to two thousand men in the whole prison. So, Indians inside the joint seemed to have more of a solidarity with each other than the rest of the prisoners that grouped off. You could really dig the sincerity of the Indian brothers. No one could do anything to one Indian brother without having to deal with the rest of them. We tried to deal as one solid being. And then we had to learn not to keep it to ourselves -- we had to learn to spread our solidarity among the blacks, the Puerto Ricans all our brothers, the whites -- because the whites that were in jail were oppressed, although we couldn't understand that at first. . . . . D-yard--the spirit was like something I never felt in my life. In the beginning,everybody was excited, and confused, like mass paranoia, feeling like the pig was coming in soon, knowing that you'd have to be confronted with death. But then again, there was also a restfulness that actually the hostages were going to save any sort of confrontation between the state and the prisoners. After a while, when the brothers started building the defense, the collectivitv started forming. People didn't need no leaders in that yard. People started in that year. People started feeling what they had to do, what had to be done. This was it -- this was everything you had talked about, everything that you had made hours of rap about. It wasn't just being able to live without the pig over your head, this structure they have has everybody in mass confusion and paranoia and madness.